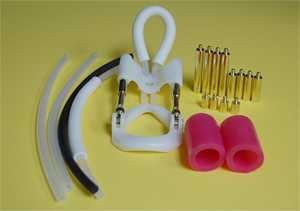 KR Extender - is our own branded noose based extender that has good quality parts without going overboard on price (can also be ordered as a part of VacExtender package). Ofcourse, our package also include upgraded parts. Click on the picture for more detail. VacADS - All of the same function as our VacExtender v4.2 without the extender part. Use it to hang light weight, manual exercise, stretch using leg strap... Click for more details. 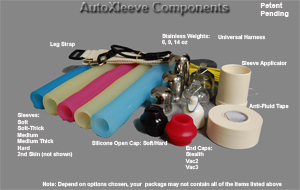 AutoXleeve - another AutoExtender device. This is a super comfortable, light force stretching system thats unlike anything else. Click on the picture for more details. VacHanger 3 - Highly versatile hanger that works on both girth and length. Click on the picture for more details. The latest version of our vacuum based extender. 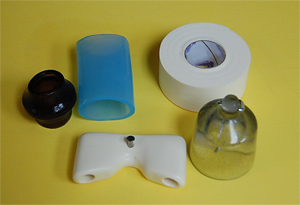 Sealing Sleeves - Used on VacExtender 2/Modified VacExtender/VacADS, also can be used on VacExtender 3 and comes in several grade of hardness. Constriction Sleeve - For those who are "extremely" sensitive to Vacumming. Again, only for extremely sensitive folks. 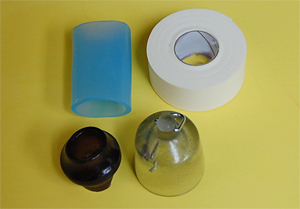 Replacement parts - elongation bars for extender, extra cylinders, base, etc. Some will be in our upgrade page and if its not, just email us for price.